Don't Waste Your Social Shares. 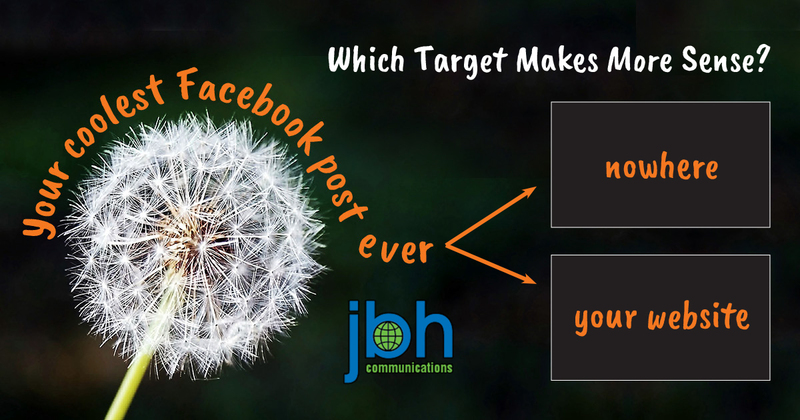 JBH Communications can help! I was eager to learn about the new focus of an excellent organization that I follow on Facebook. Then I saw it — a very cool Facebook post that mentioned the organization’s new focus. So I clicked the image on Facebook, assuming that I’d be able to learn more. No Dice. The Facebook Post Led Me… NOWHERE! Needless to say, I was disappointed. If it had been one of my own clients, I’d have been a little embarrassed. Always consider how social media posts can draw your target audience to your own website. Facebook and Twitter posts are so convenient… A quick little post about this, a tweet about that. I can understand why website owners would sometimes not want to bother with first posting on their website blog and THEN sharing to Facebook or Twitter. Occasionally that even makes good sense. However, they may have the terribly mistaken notion that their websites are just for static, old information, or that the website is so fragile that they wouldn’t want to “mess it up” by posting directly on there. But consider the lost opportunity when the social media follower wants to learn more, but doesn’t know where to go for more information! It may be the only time that follower’s interest is piqued. Your social media followers don’t know as much about your organization as you do. No offense, but they haven’t been hanging on your every word. So, give them every opportunity to come up to speed if and when they are ready to do so. Always lead them to the information that you carefully crafted on your website. In short, be sure your social media posts point to your website. Contact me if you need help crafting social media posts that link to your website. What’s Wrong with Social Sharing? Nice Icon for Your Site!